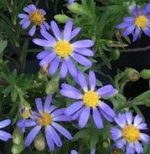 Aster is a large genus of herbaceous perennials and are members of the family that bear their name, Asteraceae, that also includes daisy, sunflower, and lettuce. The genus includes weeds as well as outstanding garden plants that are valued for their summer and fall bloom. Plants grow from creeping rhizomes and range in height from 6″ to 8′. The leaves are alternate, undivided, and narrow. The daisy-like flowers heads are carried singly or in cluster and consist of ray flowers surrounding a center of disc flowers that are usually yellow. The ray flowers may be purple, lavender, pink, rose, red, or white. 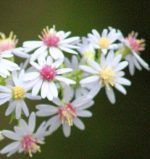 The common name and genus name, Aster, comes from the Greek word aster meaning star and refers to the shape of the flower heads. 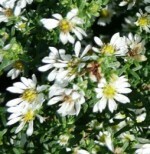 Asters thrive in enriched fertile soil on the dry side, but are susceptible to powdery mildew if too dry. 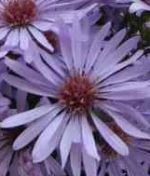 Tall and medium asters may need staking but this need can be reduced in the case of the latter by pinching one or twice in the spring. The species can easily be propagated from seed but most of the garden asters are hybrids and must be propagated by division in early spring or fall. Division every few years is necessary to maintain vigor with the exception of A. amellus which should be left undisturbed for 2-3 years. 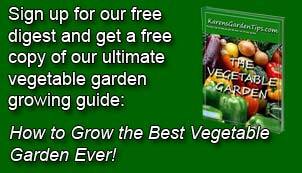 Plants can also be propagated by terminal cuttings in spring or early summer. In addition to powdery mildew, asters are susceptible to aster wilt, caused by a fungus that attacks their roots. 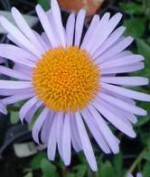 Asters that suffer this disease must be propagated by terminal stem cuttings. Some asters are more susceptible to these fungi than others but applications of a fungicide starting in the beginning of July reduces the problem. 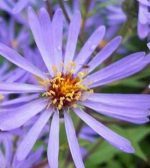 The late bloom time of asters make them especially valuable for late summer and fall when most other plants are no longer blooming or look shabby. 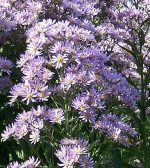 Low growing asters are good in rock gardens , front of a border, and containers; taller asters are suitable for the middle or back of back of the border.